In exploring the question of cultural identity, how do artifacts of the past contribute to shaping our individual relationships to family, friends and place? Have you ever found a photograph from a previous generation that seemed to illuminate and explain your history? Have you recently stumbled on historical photographs that call to you from their distant origin and intimate to you that they are – despite their obvious differences with your world – an integral part of why you are where you are? Sifting through family collections of printed photographs can be an enriching experience, but for some, distance and accessibility comes in the way of giving in to nostalgia through dusty and fading images. There are a number of websites that are dedicated to making archival photographs publicly accessible, through institutions or more personal sites like blogs. The web here appears again as a repository to share common histories. These are a few sites that may be of interest when considering the history of the Greater Vancouver area. 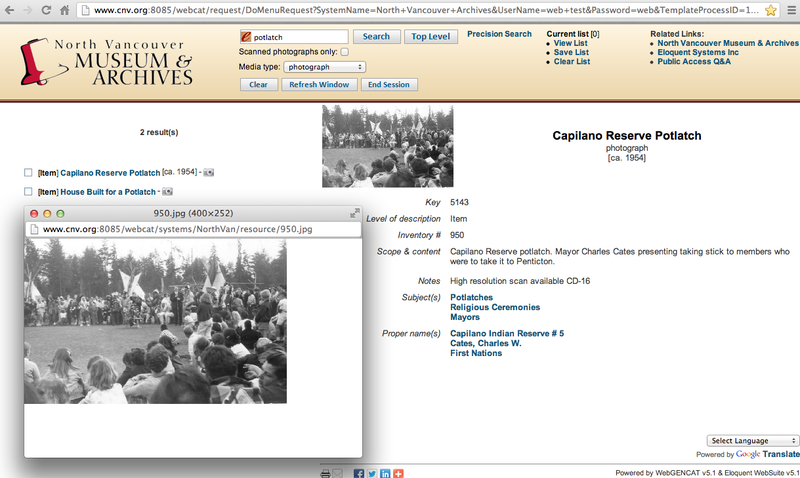 The Vancouver Public Library offers a database of about 15 000 scanned archival documents in their Historical Photographs Database. Here for instance is a personal certificate following the Chinese Immigration Act, detailing the terms of the infamous head tax imposed in Canada from 1885. Additionally, neighbours of Presentation House Gallery, The North Vancouver Museum and Archives, offer an impressive system for researching archival material online. Here is an excellent Chester Fields post from last year on how to search through their collections. It’s hard to come by images like this online! The gift-giving festival and economic system of the potlatch, as practiced by Pacific Northwest indigenous groups, was banned by the Canadian government between and 1884 and 1951.